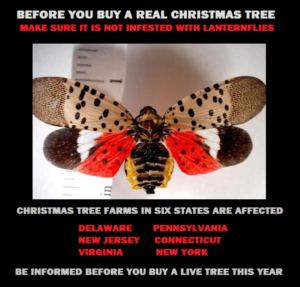 The spotted lanternfly could spoil many families’ holiday season, according to New Jersey agricultural expert Joseph Zoltowski, director of the New Jersey Department of Agriculture’s Division of Plant Industry, speaking to NJ.com. Zoltowski says the tree-killing insect could potentially spread to homes by hiding in Christmas trees and leaving eggs to hatch. The spotted lanternfly, which is a native of eastern Asia, arrived in the U.S. four years ago in Pennsylvania and has spread throughout the eastern parts of the state. The bug has recently been detected in three New Jersey counties—Hunterdon, Mercer and Warren. It is believed to spread by attaching itself and its eggs to vehicles carrying wood, landscaping materials and agricultural produce, which would include the bark and branches of Christmas trees. “They’re very hard to spot,” said Zoltowski. A woman in Warren County, New Jersey, confirmed that she found lanternfly eggs attached to her Christmas tree once the insects hatched inside her home, according to Zoltowski. The expert said that there were two egg masses discovered in the bark, which are capable of storing as many as 30 to 50 eggs each. Zoltowksi suggests that those planning to get a pre-cut Christmas tree should inspect every branch carefully for eggs and both live and dead insects before making a purchase of a live Christmas tree. Though the tree itself would only be killed by a large number of these insects, any presence of the bugs could spread in your home. “It’s a bad bug in that it could affect all types of agriculture,” Zoltowski said. According to the New Jersey Department of Agriculture: “The Spotted Lanternfly adult is approximately 1 inch long and a half-inch wide at rest. The fore wing is grey with black spots and the wings tips are reticulated black blocks outlined in gray. “The hind wings have contrasting patches of red and black with a white band. The legs and head are black; the abdomen is yellow with broad black bands. Immature stages are black with white spots, and develop red patches as they grow. Previous Post« Previous Is A Lighted Christmas Tree on Your List This Holiday Season?